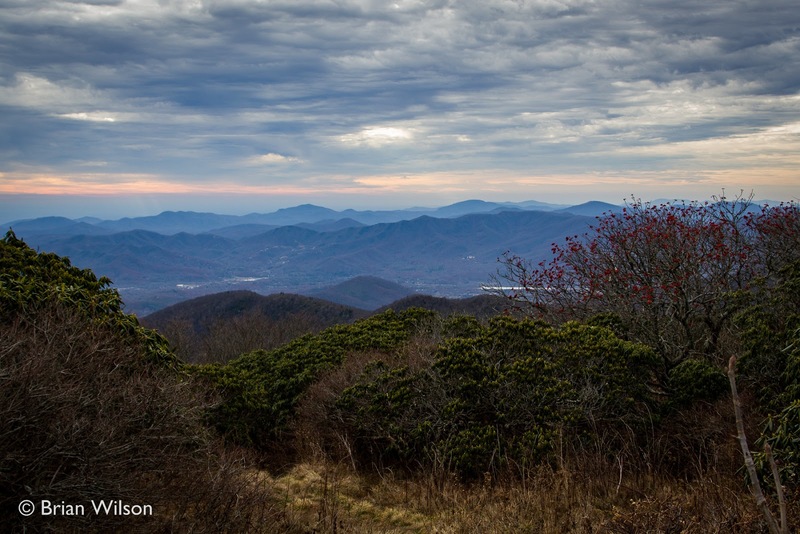 The Blue Ridge Parkway is a 469 mile road that runs from Virginia to North Carolina. The entire length of this road is a National Park and as such it's the country's longest linear park. All along the way there are various pull-offs and trails to enjoy beautiful views, walk to waterfalls, and hike up to the top of mountains for incredible vantage points. In this blog post we'll explore a few sites along the Parkway near Asheville, NC. Sitting at an elevation of 5720, Devil's Courthouse is an impressive looking mountain that offers a commanding view of the Blue Ridge Mountains. A relatively short (1/2 mile) and slightly strenuous trail leads to the rock-exposed top of the mountain. The mountain's look was thought to be sinister by some and local lore suggested that the devil himself may "hold court" deep inside the mountain. Unfortunately we could not confirm nor deny this rumor to be true. From the top you can see four states. I'm leaning towards believing this claim to be true unlike the one made by those murderous gnomes at Rock City. The view is certainly impressive and on good visibility days you can see for miles. An interesting marker bolted to a rock points out some of the peaks visible nearby. 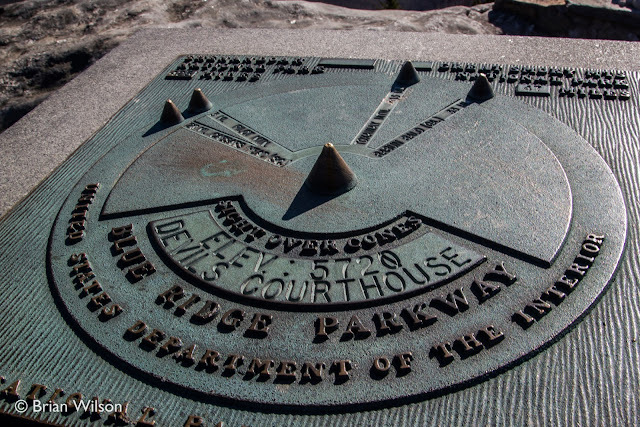 Another landmark along the Blue Ridge Parkway, near Asheville, is Looking Glass Rock. This 4,000 foot mountain is seen from several vantage spots along the parkway. From the Parkway, Looking Glass Rock looks like a rock climber's dream. On the other side there is a 3-mile (one-way) slightly less vertical hike up to the top. 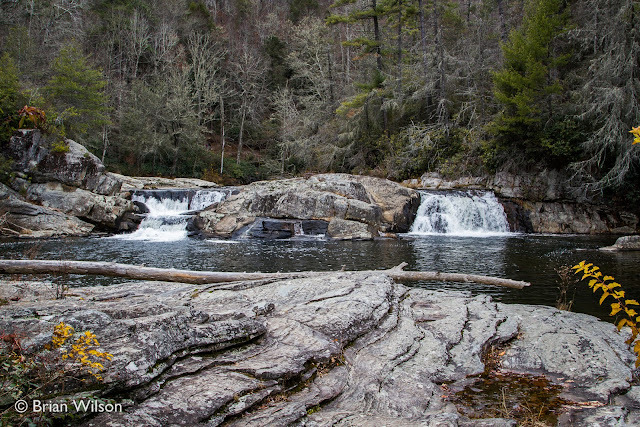 Also near here is Looking Glass Falls which looks absolutely beautiful and will definitely warrant a visit from us on our next trip to this area. 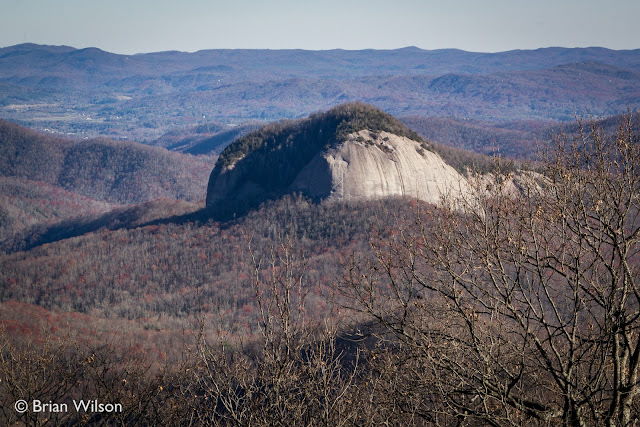 For more information about Looking Glass Rock, check out this page. 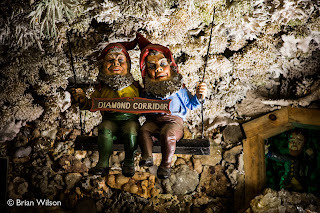 Taking the Blue Ridge Parkway northeast of Asheville brings us to Craggy Gardens. 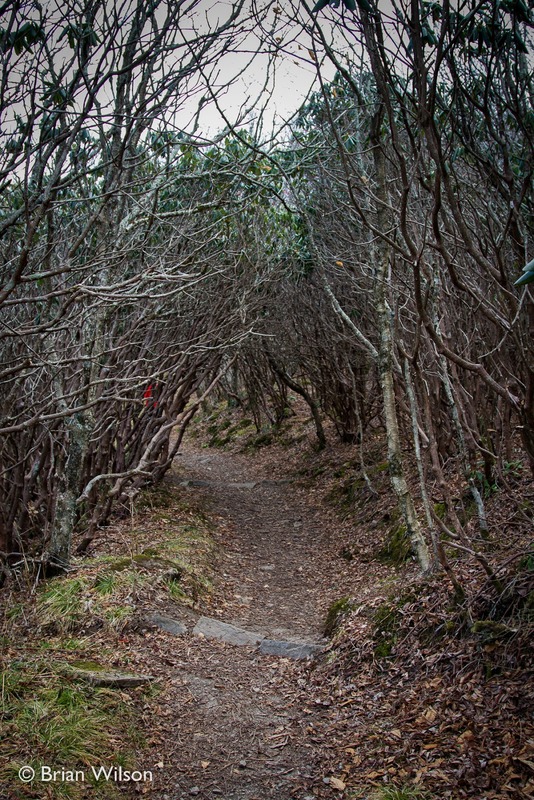 This area is known for exposed rock and wildflowers, particularly the rhododendron thickets that dominate many parts of the trail. We visited here in November, so the rhododendrons were not blooming but their empty thickets were impressive to walk through. 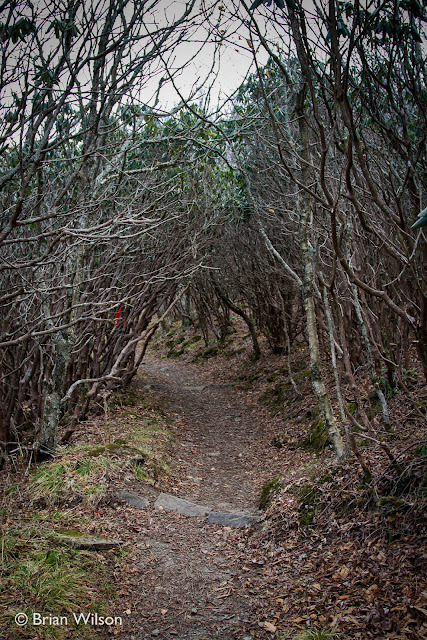 I imagine the tunnel of rhododendrons would be impressive in the spring. 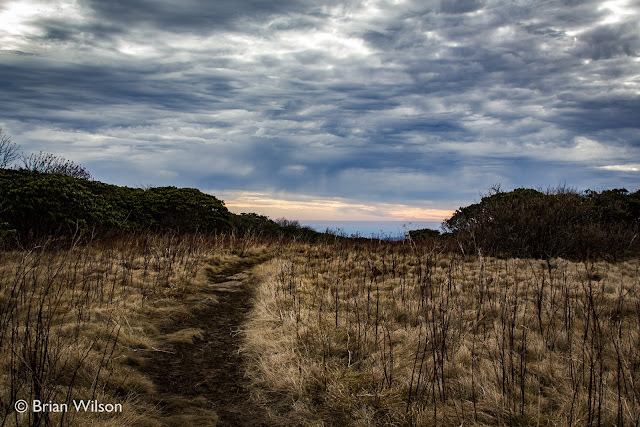 The cold day and slightly-threatening clouds made for an interesting trip to the top of this heath bald. There was no one else up here on this day, so the vacant hiking shelter and the total lack of other human beings made for a slightly creepy atmosphere. There are also impressive views to be found up here. 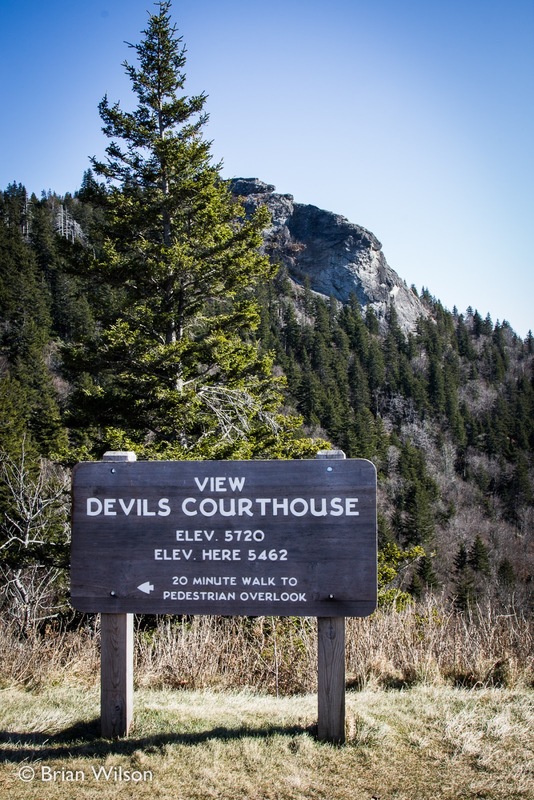 Craggy Gardens definitely stands out as a great place to stop to experience the varied landscapes and environments found along the Parkway. 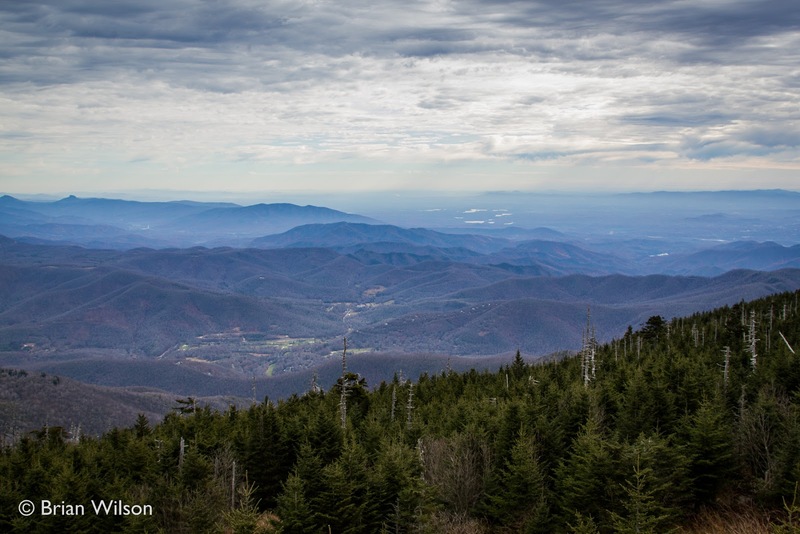 When I was a kid I remember the shocking disappointment of learning that Clingman's Dome, the highest point in Tennessee in the Smoky Mountains, was NOT the tallest mountain in the Eastern United States. That title belongs to Mt. Mitchell, a peak found in the Black Mountains just northeast of Asheville. 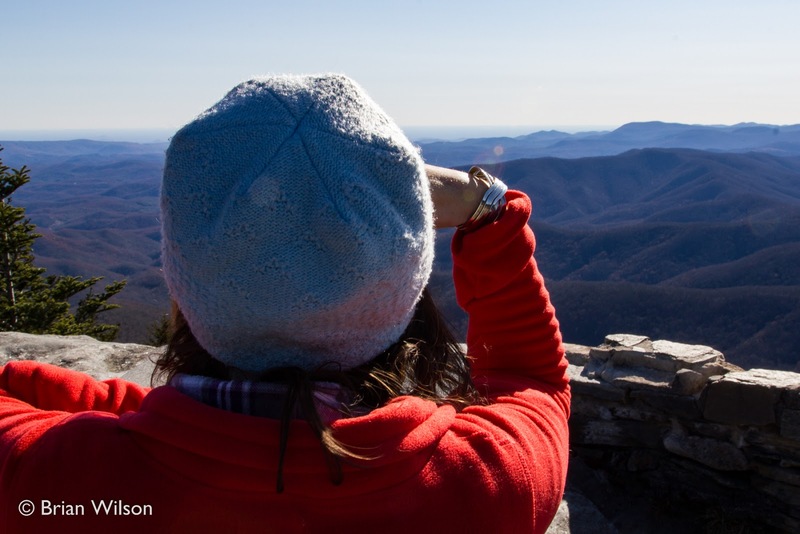 The mountain tops out at 6684 feet and it offers a panoramic view of the Pisgah National Forest and surrounding mountains from the observation tower on top. Mt. 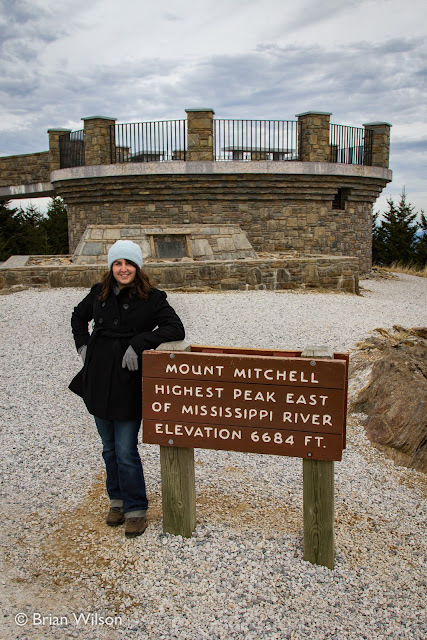 Mitchell is the featured attraction of Mt. Mitchell State Park. In this park you'll find hiking trails, a gift shop, the all important restrooms and even a full service restaurant with nice views. Note: Because of the altitude it is always considerably cooler (or colder) up here than down in Asheville. The altitude also creates an alpine-like environment with the types of trees and plant life found here. There is no admission fee charged, so this is a free visit and well worth it. You can find out more about Mt. Mitchell State Park here. Between Mt. 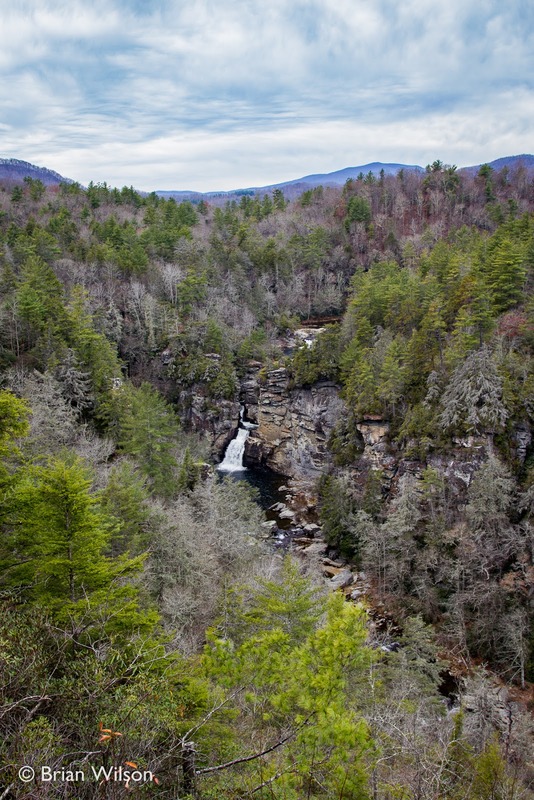 Mitchell and Linville Falls, and just off the Blue Ridge Parkway, is the resort town of Little Switzerland, NC. This town is home to a wonderful place to grab something to eat called the Switzerland Cafe. They are noted for their barbecue and offer a full menu of great things to eat. It's definitely worth checking out if you find yourself there around a meal time. Note: the cafe is only open "in season" meaning they close sometime in November and open back in in the Spring. Be sure to check out the site before planning to go there. Required viewing for anybody traveling along this part of the Blue Ridge Parkway is Linville Falls. 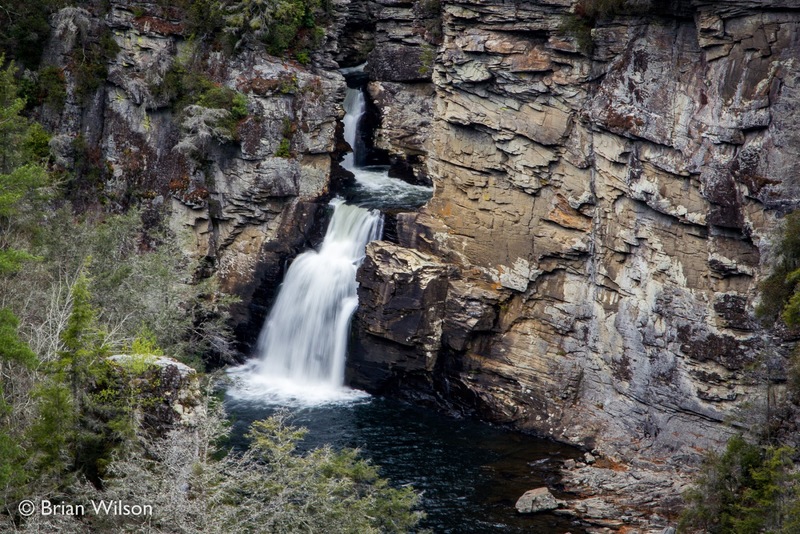 The main falls drops over 90 feet in to the Linville Gorge and the main trail offers multiple vantage points of the falls. Before you even get to the overlooks for the main falls you get a nice view of the smaller, but still impressive Upper Falls. The park is also filled with beautiful hardwood trees, so it's particularly beautiful in the fall. There are other trails that lead to different vantage points of the gorge and falls, plus there's access down in to the gorge itself and provides an up close view of the falls from the base. 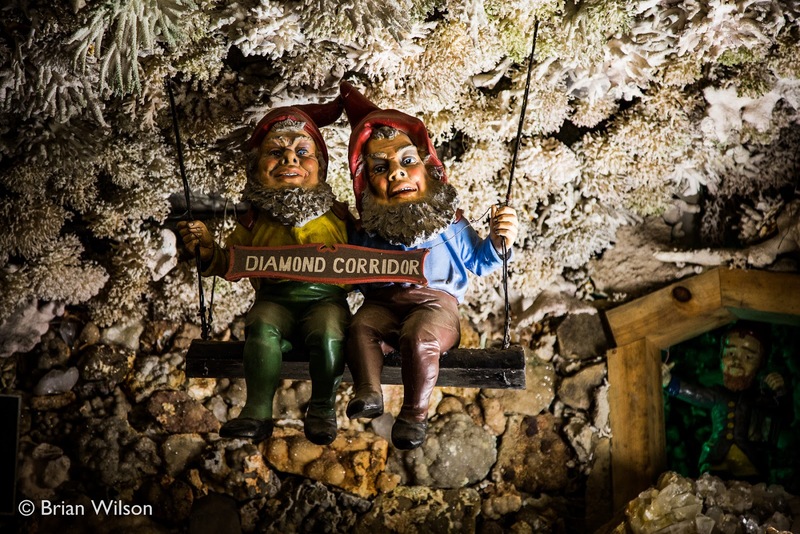 Nearby you'll find Linville Caverns and Grandfather Mountain, both popular attractions offering different perspectives of the geography and geology of the area. 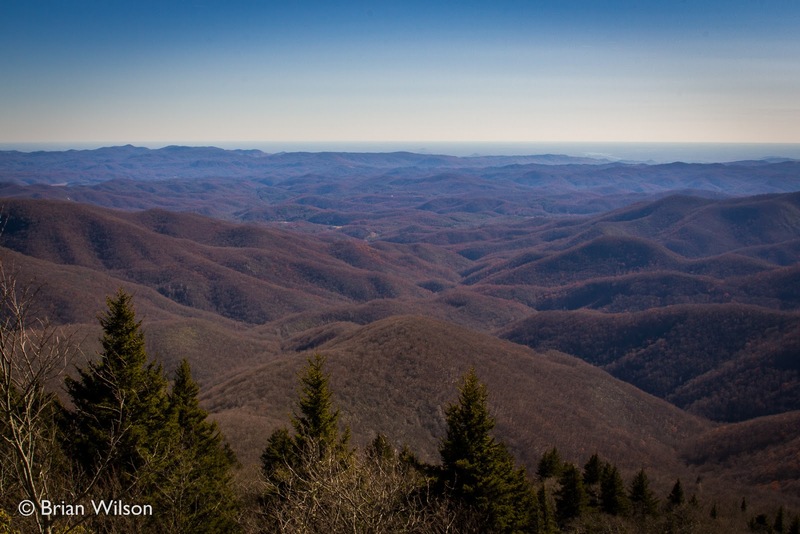 These are just a few of the many places to stop along the southern end of the Blue Ridge Parkway. For more information about the Blue Ridge Parkway, you can check out their official site.